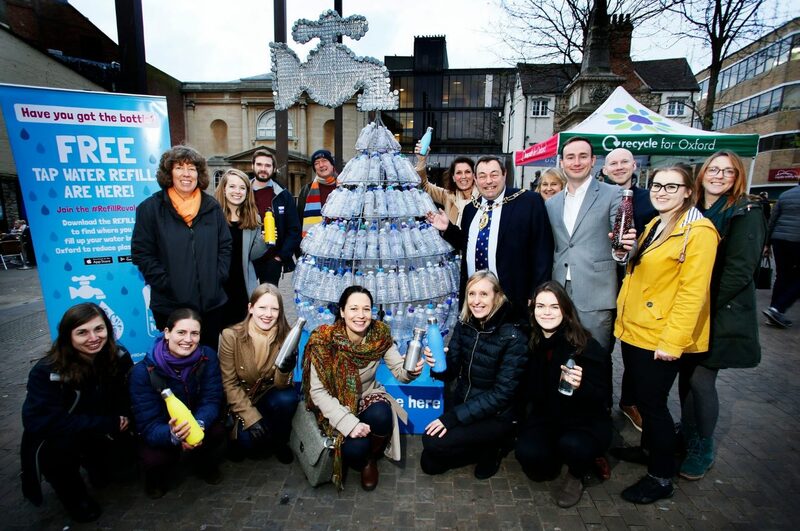 Refill launched in Oxford on 15th January with the installation of a tap sculpture in Bonn Square to raise awareness of the Refill scheme and reducing plastic waste. Thanks to an enthusiastic team of volunteers and forward-looking businesses, there’s now a network of nearly 150 Refill stations across the city – in pubs, bars, restaurants, cafes, hospital outlets, both universities, the bus station, and even hairdressers. Participating businesses display a round blue-branded Refill sticker in their window or door. All the Refill stations are marked on a map which you can download as an app to your phone to find out where they all are to access free tap water on the go. It is a simple idea: Refill links people who want water to taps with the aim of reducing the 7.7 billion single-use plastic water bottles bought in the UK each year. The Refill tap sculpture was conceived by local artist and environmental campaigner, Lois Muddiman. Nearly 3 metres tall, the illuminated water droplet is made up of 300 plastic water bottles, the number we use in Oxford, every 8 minutes. The Refill Oxford campaign wants to reduce that figure by getting more people refilling – if just 1 in 10 Brits refilled once a week, we’d save around 340 million plastic bottles a year. If you feel inspired to join the #Refill Revolution, download the Refill app and make refilling the new normal! To find out more about Refill Oxford go to: http://www.refill.org.uk and for more on the national Refill campaign, see: http://www.refill.org.uk You can contact Refill Oxford on refill.oxford@gmail.com.